The Arts & Entertainment pull-out section published this piece in print on Sept. 15, 2016. 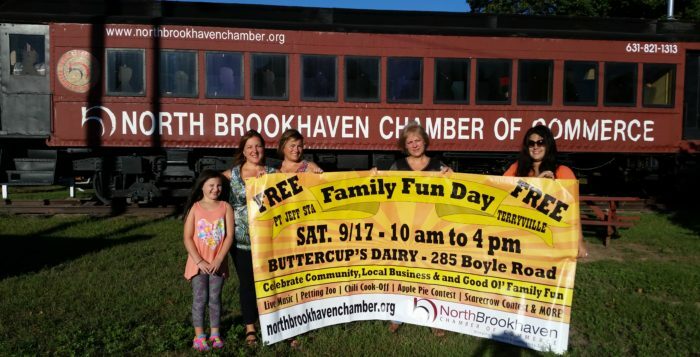 Community members young and old will enjoy good old-fashioned family fun at the North Brookhaven Chamber of Commerce’s first ever Family Fun Day on Saturday, Sept. 17 at Buttercup’s Dairy, 285 Boyle Road in Terryville (at the corner of Old Town Road). From 10 a.m. to 4 p.m., attendees of the free event will enjoy live music, a petting zoo, an apple pie baking contest, a chili cook-off, a scarecrow contest, selfie stations and more. Admission is free and there is no rain date. An opportunity for community members to learn more about their local businesses, Family Fun Day will feature representatives from Old Town Blooms, Cumsewogue Historical Society, Stony Brook University, Bass Electric, Great Clips, People’s United Bank, Masone Natural Healing, Home Performance Technologies, R & B Electrical (Solar), Kiddie Academy, Port Jeff Bowl, Comsewogue Public Library, TFCU, Renewal by Anderson, Little Flower Children’s Services, Gutter Helmet, Coach Realtors, Everlasting Memories in Time, Kitchen Magic, PJS/Terryville Civic, Bethpage Federal Credit Union, Habitat for Humanity and Brian Yonks Chiropractic. Dzvonar said she is most excited for the scarecrow contest, where families are encouraged to work together to create a unique scarecrow at home and bring it to the event to be displayed. The top submissions will receive ribbons. Planning for the event has been underway since last November, and committee member Craig den Hartog said everyone involved is “excited to just get it started.” He is going to be on hand to help set up tents and direct traffic. A volunteer with Old Town Blooms, den Hartog will also be sharing information about the community beautification project, which has planted over 20,000 daffodils in the area over the last seven years. “The fact that our event benefits the community is the most important part,” den Hartog said. 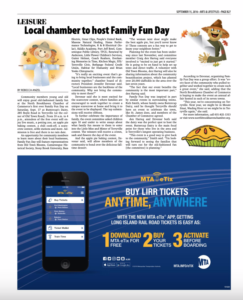 According to Dzvonar, organizing Family Fun Day was a group effort. It was “every facet of the community who pulled together and worked together to create such a great event,” she said, adding that the North Brookhaven Chamber of Commerce is hoping to make the event an annual affair hosted in each of its seven towns. “This year, we’re concentrating on Terryville. Next year, we might be in Mount Sinai, Wading River or we might be in Terryville again,” she said. rom left, Vanessa Molinelli, Jennifer Dzvonar, Joan Nickeson, Donna Boeckel and Lisa Molinelli from the North Brookhaven Chamber of Commerce. Photo from Jen Dzvonar. 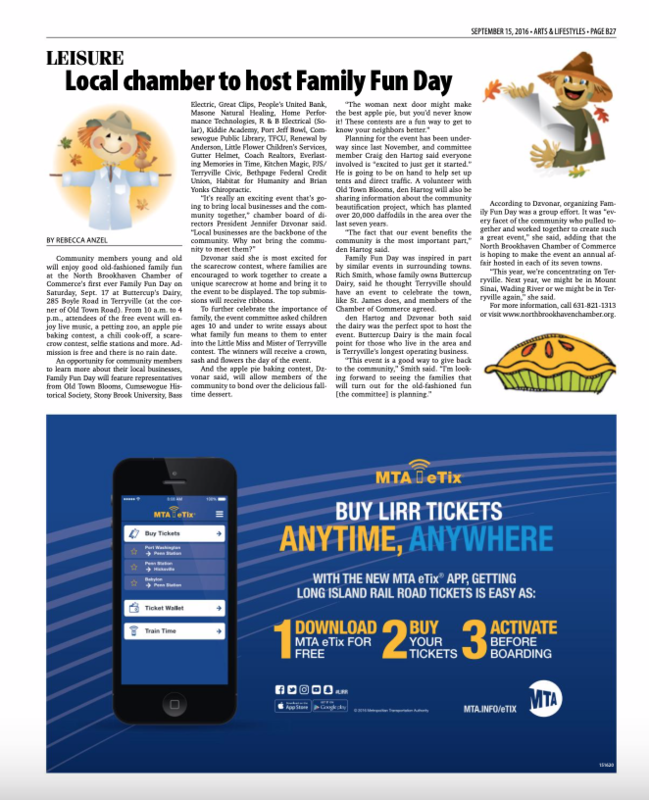 For more information, call 631-821-1313 or visit www.northbrookhavenchamber.org.